It is not your next average feature book. It is much more. It tells what to do and which features to use for setting up a neat system for everybody to use. Tricks and practices in this book usually take weeks to find on the web and even then it is still unclear which approach is the best – we solved it for YOU! Part numer generator – this is macro what generated “IDNumber” property and propose “Save As” for model files. Macro original authors are mentioned in code and text file. Really thank you for then for amazing job. Having worked with SolidWorks professionally for over 5 years, I could relate to most of the setup dilemmas described by the authors. I think this book alone might not be enough to set up SolidWorks in a way that would avoid problems in the future. What I mean by this, is that the reader needs experience to really understand the importance of the available choices described in the book – but I’m not saying that a beginner could not benefit from this. While the book alone will not make you go from zero to hero, it sure can save you immense amount of time and money as the authors provide you the working solutions to choose from. If you can figure out what works for your company, the book will pay for it in no time. I think this book has the right concept. I’ve been working with SolidWorks for 20 years and most of the things I had to learn by trial and error. This is a possible way, but it takes a very much time. The book also describes the main problems and gives possible ways to solve them. Good idea and nice implementation. This is a great book, this gives the user hands on experience. I have been using SolidWorks for 20yrs and also teaching on the side and these lessons are not taught in the school room. 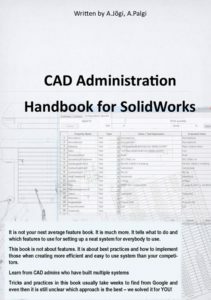 This is a great book for any CAD administrator or Eng Manager, I would recommend making all of my team read this book! 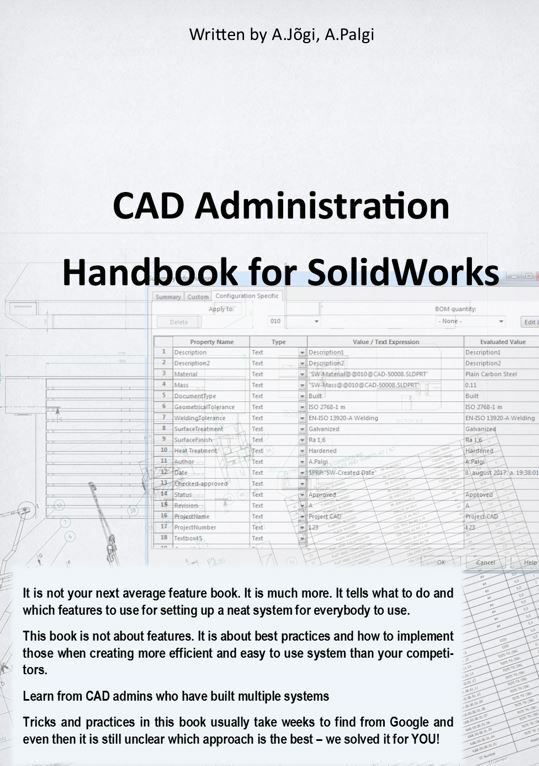 Highly recommended for CAD admins and SolidWorks users!